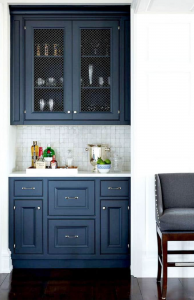 Like fashion, kitchen design is always embracing new trends. In the past decade, we’ve seen an influx of white, greige and cream; but, a new color palette has come into play! Yes, you know what I’m talking about: navy blue, hunter green, cool blush, kelly green, and deep teal are all popping up on cabinets! In a designer’s mind, cabinet color trends are a must have, but how do you decide if color is the right choice for you? Think about your personal style – maybe take a look in your closet. Is your palette filled with neutrals or does it lean more towards a rainbow? If you have a plethora of neutrals, you might consider sticking with a classic dark stain, white or a cream. If you’re surrounded by color, then a colorful cabinet might just be the right move! Have a combination of color and classics? Take into consideration that a neutral surround and colorful island might be the dynamic duo you’re looking for! Another option to ponder – add color to your base cabinets leaving the top half neutral. Still not quite sold on the color movement? 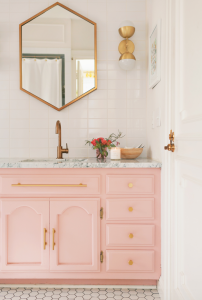 If you don’t feel like color in the kitchen is a trend you love, marinate on adding a pop of color to a bathroom cabinet. In addition to your closet, your current interior decor can also help you discern if a colorful kitchen is the look for you. Take note of your wall colors, accent pieces, and overall theme of your home. 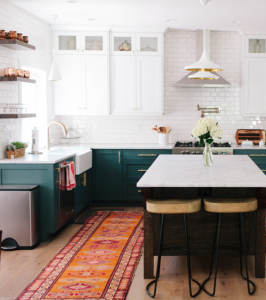 If you have a traditional sensibility throughout your space, a stain or neutral is likely more suitable for your kitchen style. If you are loving the mid-century modern look as much as the next guy/gal then incorporating a color would greatly complement your aesthetics. Does your design style scream eclectic? Then your kitchen should too! Mix a neutral surround with a pop of color on your island to bring continuity to your home! Again, don’t forget about that powder bath – it’s a great place to add a little punch! 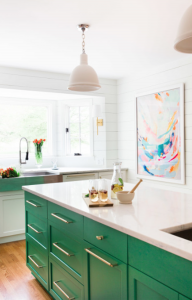 Colorful cabinets are trendy and fun! If you’re on the market for a change, be sure to visit The Affordable Companies and let one of their designers help select your palette. Visit them at their website www.the-affordable-companies.com or call 317.575.9540 to set up an appointment.